This application was developed for iOS devices running version 11 or newer and functions with any iOS device and updated for 2018. 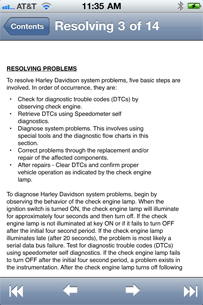 This application is designed for Harley Davidson owners to lookup Diagnostic Trouble Codes (DTCs) that are reported by the engine and read about what they mean and possible causes and resolutions. Here is how it works. 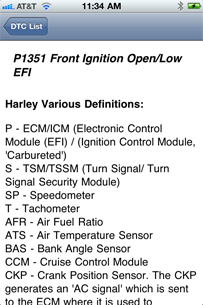 You run Harley DTC and enter the DTC code you wish to lookup. 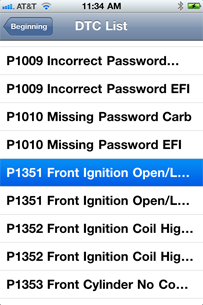 The application finds the closest match and brings up a list of all codes. From there you can enter a detail screen showing the code and useful definitions. You also can then read the documentation from the main page to read more about the codes, possible causes and resolutions. Updated with more DTC codes than ever! Easy to use simple DTC code lookup. Complete DTC code list with detail views. Startup engine sound that can be disabled in settings. You can purchase Harley DTC by clicking here now. 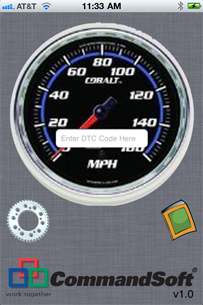 Version 1.2 updated for latest iOS releases with more DTC codes than ever! DON’T FORGET TO RANK US IN THE APP STORE! ! ! Support email support@commandsoft.com for help, to make suggestions, or to report problems. CommandSoft® is a privately owned company with a rich tradition of leadership specializing in the development of shared storage hardware and software solutions for the Media and Entertainment industry.